Assistant Professor Akshay Mutha exemplifies how our faculty are more than a group of excellent teachers; they’re a group of educators teaching from years of cumulative global business experience. From Wall Street to Main Street, our graduates energize economies, lead boardrooms and address global challenges head on. 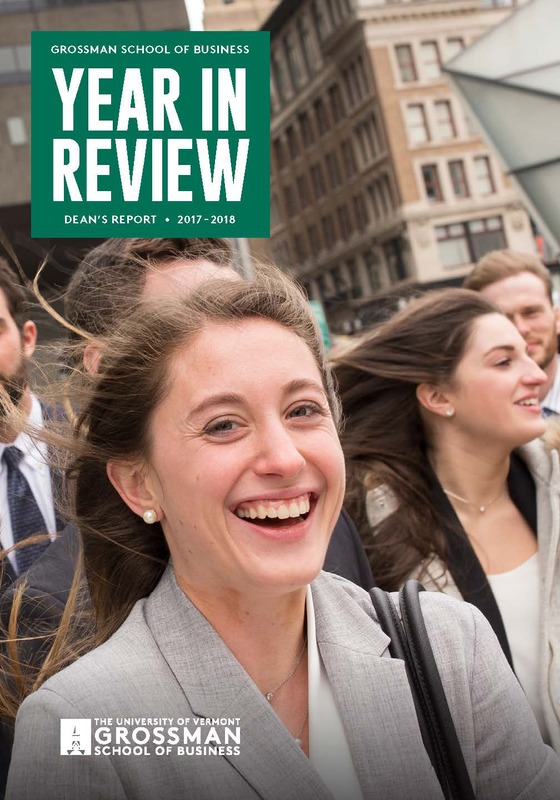 One amazing year in the life of Grossman School of Business, our 2016-17 Year in Review. Our size is just right — world-class faculty conduct cutting-edge research while mentoring and teaching; and our academic program is rigorous. But the proof is in the results — graduates get internships, find jobs and feel satisfied with their experience. Read more about us. Business education at the UVM Grossman School of Business is accredited by AACSB International. What does being AACSB-accredited mean? It means attending a business school in the top 5% worldwide. The Association to Advance Collegiate Schools of Business (AACSB) Accreditation represents the highest standard of achievement for business schools worldwide. Less than 5% of the world's 13,000 business programs have earned AACSB Accreditation. The University of Vermont’s AACSB-accredited Grossman School of Business produces graduates that are highly skilled and more desirable to employers than other non-accredited schools.